Cutaneous melanoma is an aggressive tumor, with a poor prognosis for patients with advanced disease and resistance to current therapies. 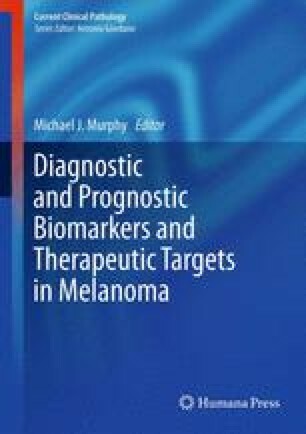 Both the RAS/RAF/MEK/ERK (mitogen-activated protein kinase [MAPK]) and the PI3K/AKT signaling pathways have become crucial targets for pharmacological development, being constitutively activated through multiple mechanisms in melanoma. Mutations of BRAF have been proposed to contribute to melanoma development. Increased activity of the MAPK pathway prevents apoptosis and induces cell cycle progression. PTEN deletion leads to AKT activation, which can result in the phosphorylation and inactivation of RAF. This decrease in downstream MEK and ERK activation may lead to the loss of differentiation or cellular senescence. A wide array of molecular-targeted agents against BRAF signaling, MEK signaling and mTOR are currently undergoing clinical evaluation. Current opinion now points to the need for concurrent targeting of several pathways in order to control melanoma growth, survival, and metastasis, due to the presence of redundant protein functions and compensatory/adaptable signaling pathways.